In which our hero heroine faces discovery, the running gags continue, and a new female character joins the cast. And promptly falls for our hero heroine, not realising that he she's also a girl. Whoops. Housekeeping: Again if this is your first time here, you can find out more about the Ani-Club and how to participate via this finely crafted link. A reminder of the general rules of Ani-club: discussion is only for the series up to this point, no spoilers for later episodes. After next week we'll also be moving from a two episode a week format to a three episode a week format. There'll be another reminder next week though. I'm going to keep my impressions short this week, I'm starting to wonder if a comedy series was the best choice for this. It's entertaining, but avenues for in-depth discussion are somewhat limited. At any rate on to episodes three and four. I felt episode three fell a bit flat, it was funny but it didn't really go anywhere. I still find it refreshing though to see a female anime character who doesn't have a fit whenever anyone walks in on them in a state of undress. Maybe I've just been watching too many series with tsundere leads lately? Episode four I felt was a lot stronger though, although I find Renge's personality grating (which is likely deliberate) the show probably needs another female presence in the main cast. Especially when the only other girl in the cast spends the majority of her time pretending to be a guy. To the point where it seems to be Tamakis ultimate goal to get her to dress like a girl again. Some of the jokes this episode really made me chuckle though, especially when Hikaru and Kaoru question why Renge has cast Kaoru in the seme role. Since Kaoru is normally the uke in their faux homosexual relationship. If you don't know what an uke/seme are though you might have been as confused as Haruhi in that scene. I think the twins are growing on me a lot. While I don't think pretending to be in a homosexual twincestuous relationship is perhaps the most effective way to pick up girls they're definitely entertaining. 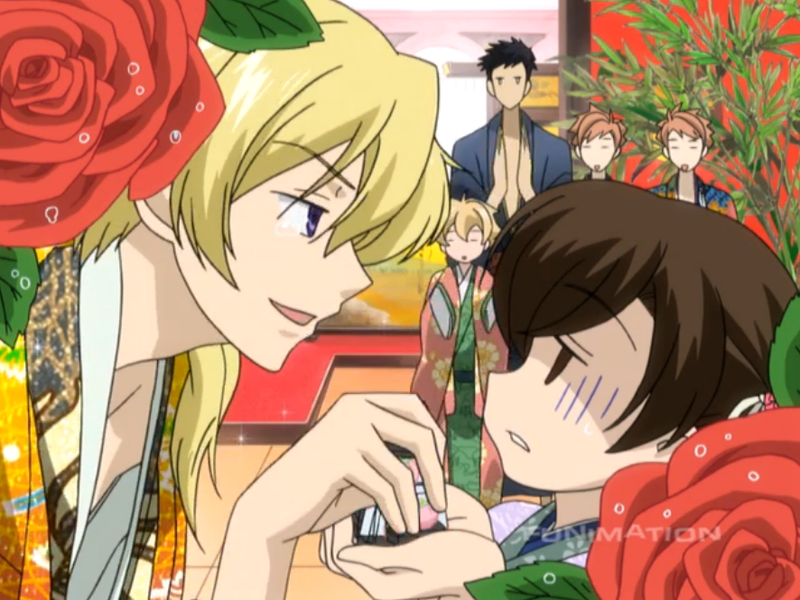 They're also the most mischievous members of the cast, and like hitting on Haruhi just to piss off Tamaki. I can't really bring myself to like Honey though, so far he's just been rather annoying and one dimensional. Mori has a more interesting character, and he's barely said ten words over the course of four episodes. He is a classic stoic though. Well next episode looks like it's going to be largely about the twins, so it should be fun. Remember to add your own impressions and watch episodes five and six by next week.